Today Plinky demands that I talk about my top celebrity sightings. Ok – haven’t had many of those, so it’s not diificult to recall them – and it occurs to me that there’s a writing lesson to be learnt here. When our children were young we decided to spend the afternoon with a friend at Brogdale Farm, just south of Faversham in Kent. What’s so special about a farm, I hear you ask. You ignoramus! Do you not know that Brogdale Farm is home to the National Fruit Collection, and supplier of fruit to her Majesty? Tsk, tsk. No, we didn’t see the Queen. Don’t get excited. We had gone there on a whim qite late in the day, and found that we were just too late for a guided tour. Rather disappointed, we were just about to head off for a mooch around and a quick look in the gift shop, when there was…well, a commotion might be going too far – let’s call it a slight stir – over on the ticket desk. And then someone came over and told us that there would be another tour after all, if we would like to come. We looked over. Who’d managed to wangle that then? What did they have that we didn’t? It looked like an ordinary family. Then the Dad turned round. 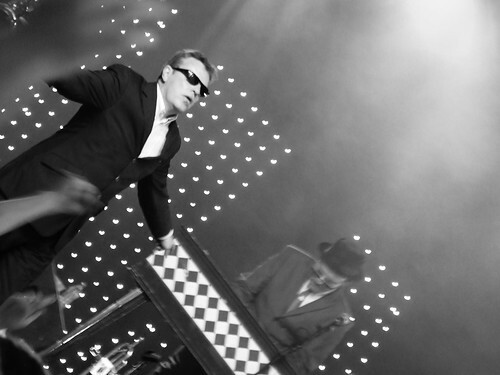 It was Suggs from Madness.Mystery solved. Did we have a good time? Yes. Did we ask him to autograph a pear for us? No. We played it very cool. Didn’t even hum ‘Our House’ as we wandered round learning about the Queen’s favourite apples. Oh and Techie Husband and I have also sat opposite the lovely Patsy Byrne (y’know – Nursie from Blackadder) on the tube – many years ago now. We didn’t ask for an autograph then either. Why? Well she was very simply dressed and nobody else had noticed her. (She knew we had though and gave us a lovely smile). I thought she deserved to be left alone. And – I’m embarassed to admit I couldn’t remember her real name, and felt if couldn’t, I didn’t really deserve an autograph. Oh! Almost forgot! Walked past Rory McGrath a couple of years ago during the Cambridge Science Festival. On the whole, I’m quite pleased I saw these celebrities when they were just going about their daily lives. After all, they’re just normal human beings who have a talent. That talent is just one facet of who they are. And perhaps that’s a good reminder to those of us who write, when we develop our characters – we may have to show their strong and possibly controversial traits, but we shouldn’t forget to show them as rounded people – nobody is all about ambition, greed, revenge, adventure, love, research…whatever. So don’t forget – let them have a cuppa occasionally. They’re characters – not just the embodiment of a theme, or a plot device.